Image credit: Shigeyuki Kihara (Samoan, b. 1975). Still from Galu Afi; Waves of Fire, 2012, digital video. Collection of the James Wallace Arts Trust. Courtesy Shigeyuki Kihara Studio and Milford Galleries Dunedin, New Zealand. Salt Lake City – An upcoming Utah Museum of Fine Arts (UMFA) exhibition introduces work by a Samoan-born performance artist interested in the complexities and contradictions of Pacific Island history and culture. salt 8: Shigeyuki Kihara, the latest in the UMFA’s exhibition series focusing on emerging international artists, features the artist’s photographic, video, and dance-based explorations of cultural identity, colonialism, representation, gender roles, and spirituality. The solo exhibition opens on August 2. The centerpieces of salt 8: Shigeyuki Kihara will be two large-scale looping projections of the artist’s 2012 videos Galu Afi; Waves of Fire and Siva in Motion, presented in the UMFA’s second-floor salt gallery. 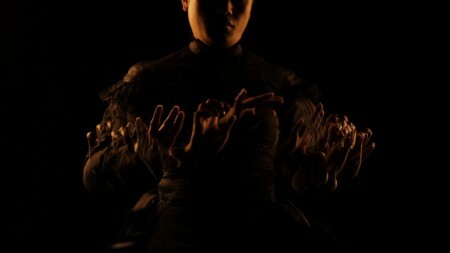 Inspired by the traditional Samoan dance Taualuga, Kihara’s performances are lamentations for losses Pacific Islanders suffered in the 2009 tsunami and poetic meditations on the impact of colonialism and the destructive potential of climate change. In Kihara’s interpretation—she dances alone, confined in a Victorian mourning dress—a traditionally celebratory group dance becomes an elegy and a metaphor for fused cultural traditions. Additionally, some of Kihara’s photographs will be on display in the UMFA’s Dolores Doré Eccles and Frank Sanguinetti Exhibition Wing Pacific Island gallery, adjacent to the salt gallery, where their juxtaposition with traditional Oceanic objects on view from the Museum’s permanent collection is meant to raise questions about Western responses to Samoan customs, including the colonial imposition of European ideas of gender and sexuality. Kihara’s attention to gender issues is informed by her identity as a fa’a fafine, the Samoan term for someone who is physically male but gifted with the spirit of both female and male and who adopts the social role of a woman. The fa’a fafine is essentially a third gender in Samoan culture, much like the “two-spirit” person in traditional Native American culture and the transgender person in the contemporary Western world. Kihara will give a dance performance at 6 p.m. on Wednesday, October 23, and an artist talk at 4:30 p.m. on Thursday, October 24. Both events, free and open to the public, will be held in the Katherine W. and Ezekiel R. Dumke Jr. Auditorium in the UMFA’s Marcia and John Price Museum Building. Kihara was born in 1975 in Samoa to a Samoan Christian mother and a Japanese Buddhist father. After living in Samoa, Japan, and Indonesia, she moved to New Zealand in 1989 and went on to study fashion and to work as a fashion stylist. Her artwork was first exhibited at Te Papa Tongarewa/Museum of New Zealand in 2001 and in 2008 was the subject of a solo exhibition, including a live dance performance, at the Metropolitan Museum of Art in New York. She has also exhibited work at San Francisco’s de Young Museum, the Museum of Contemporary Art Australia, and the Zendai Museum of Modern Art in Shanghai, China, among other fine arts institutions. Last year she won a New Generation Award from The Arts Foundation of New Zealand and a Paramount Award at the 21st Annual Wallace Art Awards. This fall Kihara will be an artist in residency at the International Studio and Curatorial Program in New York. salt 8: Shigeyuki Kihara is the first of four exhibitions opening at the UMFA this fall devoted exclusively to modern and contemporary art. The UMFA thanks community partner Equality Utah for its support of this exhibition. salt is the UMFA’s ongoing series of semi-annual exhibitions showcasing work by emerging artists from around the world. salt aims to reflect the international impact of contemporary art today, forging local connections to the global and bringing new and diverse artwork to the city that shares the program’s name. For more information about this exhibition and the salt series, including essays by the UMFA’s curator of modern and contemporary art, Whitney Tassie, please visit http://umfa.utah.edu/salt. The UMFA welcomes Equality Utah and TEA of Utah as they present the fourth installment of the “Equality in My Community” Town Hall Series. This community dialogue is aimed at encouraging greater understanding among Utah residents about the state’s transgender community and offers a glimpse into the lived experience of more than 11,421 Utahns who identify as transgender. salt 8: Shigeyuki Kihara will be on view during the event, and the Museum is offering free admission to attendees who arrive at 5 p.m. or after to view the exhibition.